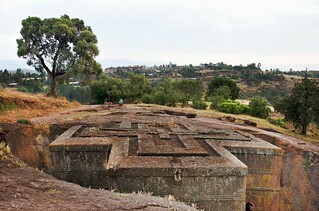 The roof of the 13th century rock-cut Church of Bet Giyorgios in Lalibela, with its crosses carved in relief, is one of the great iconic images of Ethiopia, and rightly so. "The most remarkable of the Lalibela churches, called Bet Giorgis, is dedicated to St. George, the patron saint of Ethiopia." "According to legend, when King Lalibela had almost completed the group of churches which God had instructed him to build, Saint George appeared (in full armor and riding his white horse) and sharply reproached the king for not having constructed a house for him. Lalibela promised to build a church more beautiful than all the others for the saint." "The church of Bet Giorgis is a nearly perfect cube, hewn in the shape of a cross, and is oriented so that the main entrance is in the west and the holy of holies in the east. The nine windows of the bottom row are blind; the twelve windows above are functional." "One of the most sophisticated details of Bet Giorgis is that the wall thickness increases step by step downwards but that the horizontal bands of molding on the exterior walls cleverly hide the increase." "The roof decoration, often used today as the symbol of the Lalibela monuments, is a relief of three equilateral Greek crosses inside each other. The church is set in a deep pit with perpendicular walls and it can only be entered via a hidden tunnel carved in the stone."